TLDR: A 7 nights yacht sailing course designed to give those needing the skills and qualification to confidently sail with friends or family on a flotilla or bareboat yacht charter worldwide, including on places like Greece, Croatia etc. Standard Price: £799pp (+ Optional* £195.00 Online Shorebased Theory Module & Course Pack). (*If you already have a Day Skipper Theory or higher certificate you can choose to ignore this option). Duration: 7 Days/Nights, Sun-Sun. Check-In @ 1830hrs on Day of Arrival. Ends around 1500hrs on final day. Location: Starts/Ends Largs Yacht Haven, KA30 8EZ. Sailing Area is the beautiful and challenging Firth of Clyde & Islands, West Coast of Scotland. Free 24hr Secure Parking + Direct Air, Rail & Road Links. Most clients join us from England & Wales and abroad. Typical Attendees: Individuals, couples and friends wishing to be able to go on flotilla or bareboat yacht charter sailing holidays abroad in Croatia, Greece, Med, BVI and another EU & Worlwide sailing destinations. Most do not have a lot of prior yacht sailing experience or confidence. Deposit/Balance: £49 Deposit To Reserve. Balance due 28 days prior (auto e-mail reminder sent). You can cancel for a full refund of anything paid, or change dates, at any time up to 28 days prior. All bookings include free financial protection via our booking platform. Our Fleet: 2011 Bavaria 47, Bavaria 44, Hanse 411, Beneteau Oceanis 393 - Comfy, modern cruising yachts typical for flotilla & bareboat charters in Croatia, Greece & Worldwide. All vessels fully coded, insured, RYA AND MCA Inspected. Short Description: Need your ICC so you can go on a flotilla or bareboat in Croatia, Greece or other worldwide yachting destination? Need the training to be confident and safe when berthing in tight spaces as well as sailing, navigating, anchoring etc? Don't have much prior practical or navigation theory experience? Need an Internationally-Recognised Photo-ID Licence Certificate to sail in the UK, EU & Worldwide? Then this fun practical training course week plus online shorebased training content is for you! Comfy & MODERN Sail Cruising Yachts 40-47 Feet from Beneteau, Jeanneau, Hanse, & Bavaria - just like on flotilla and bareboat sailing holidays! Globally-experienced Sailing Instructors & Professional Skippers - been there, see it and done it - and are here to pass their knowledge on to you so you can be safe, confident, relaxed - know what you're doing and LOOK like you know what you're doing! You don't need to have a huge amount of sailing or navigation experience - in fact, most people who join us have had some previous dinghy sailing experience, sailed with friends, done a basic Start Yachting Weekend course or, at the upper end, may even have already been on a flotilla and want to start bareboating on their own. It's recommended you've around 3 days' sailing on board a cruising sailing yacht before attending this course. Contact us for more detail if you're unsure. Most people need and want to build confidence as well as their skills, and also need to ensure they are up to speed with navigation, safety, lights and shapes, rules of the road, tides, anchoring etc. That's where our Online Navigation & Theory Support Course (NTSC) comes in. If you haven't already completed and received the certificate for an equivalent or higher shorebased course in navigation and theory, like Day Skipper or Coastal/Yachtmaster, you'll need to add the NTSC option to this course booking so that you can get advance access to the complete online Training Course, Video Support Content and RYA Course Pack, delivered FREE, to your address. You can add this at time of booking, or afterwards, if you need to. 7 Days/Nights Training, Coaching and Assessment to get you to the level you need. All On Board Accommodation inc all meals, snacks & drinks etc. 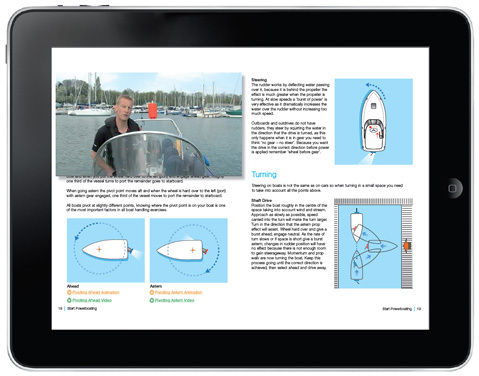 Add The Online Training Course, Extra Day Skipper / ICC Level Video Content, Full RYA Course Pack with Charts, Navigation Handbook, Plotter & Divider Instruments PLUS FREE UK DELIVERY for just £195! Sailing Waterproofs - Bring Your Own or Hire a Full Set of XM T5000 Offshore Jacket AND Salopettes for just £3/day per item (every size XXS-XXXL available). Shared cost of any marina fees (typically £7-9 each if you visit a chargeable marina, to access facilities such as shore-power, toilets, showers, wifi, laundry / nearby shops / amenities etc etc). Royal Yachting Assocation ICC Fast Track 7 Days/Nights RYA International Certificate of Competence Practical Yacht Cruising and Sailing & Sail Training Courses run every on selected weeks throughout the year. How Does It Work? / What Do We Do? This is a 7 Days/Nights extended 1-week training course, with a reduced number of students (max 4 yet yacht) for more helm-time, as well as the Online Navigation Theory Support Course available prior to your arrival. It's designed to get you the skills, experience & internationally-recognised qualifications necessary to take your first flotilla or bareboat sailing holiday, without getting bogged down in advanced shorebased theory or extended offshore sailing in conditions that you're not likely to experience early on during your enjoyable sailing holidays. We focus on what you need to be safe, confident and competent. Our Instructors and Professional Skippers have been there, seen it and done it - and most are either yacht-owners themselves or with sailing / charter experience in the same places you're probably going to go too. Day 1 is for check-in / arrival is for meet & greet from 1830hrs: signing crew forms, getting settled into your cabin, start safety briefing, have something to eat and discuss the upcoming course, as well as letting your Instructor know who you are, what you've done, not done, and what you hope to get out of the training course (e.g. are their particular areas that you feel you need to focus on, such as berthing / marina skills?). The following days are then used to get everyone up to speed on the practical handling elements, sail handling, winching, tacking, gybing, navigating, obeying the rules-of-the-Road, Man Overboard Drills, Approach & Entry to Anchorages, Mooring Bays, Marinas, Close Quarters Handling and Berthing. The final practical day is when another of our Professional Skippers / Instructors will join us to observe everyone working together to individually as skipper complete all the ICC Assessment elements as per RYA Guidelines, so they can sign off your ICC Application Form! Can I Bring a Partner, Spouse or Friend? Yes! Many people bring a partner, spouse or friend to do either the same course alongside, or just to come for the experience so as to learn how to get involved and help manage and sail the yacht, as well as help with berthing, anchoring or to take over in an emergency. If you book two places as a couple you will always be guaranteed a private double cabin. You can check availability and book securely online on our website. It's just £49pp deposit to reserve, the balance is due 28 days reminder and you'll get a handy automatic reminder too. Remember, you can cancel for a full refund of anything paid, or change dates, at any time up to 28 days prior, and every booking made via our secure booking platform includes free financial protection. Meet at 1830 on Sunday evening with familiarisation of yacht and basic safety brief. ICC Course briefing in-class, discussion of weeks activities, shorebased theory session then out on the water in local area with basic sailing training, the return to base. Further evening shorebased session on charts and rules of the road. Sail to Holy Loch arriving for Lunch. Pontoon practice in afternoon. Return to Largs. Man Overboard Drills, motoring onto mooring buoys. Basic application of Nav inc 3 point fix, Estimated Position and Dead Reckoning. Evening class theory. Sailing and Navigating using course-to-steer to local destinations. Anchoring and berthing practice, practicing skills and drills with Crewmembers including coming alongside.